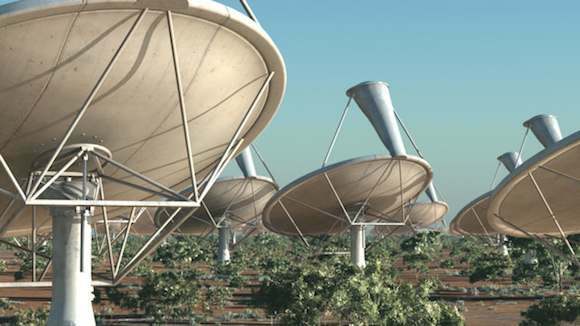 The square kilometre array (SKA) will be shared between Australia and South Africa. The colossal radio telescope was the subject of bids from both nations, each of which hoped to secure the rights to host hundreds of radio telescopes with a combined surface area of one square kilometre. The SKA Committee decided on Friday, European time, that it can build a better telescope by spreading it around, although most of the physical infrastructure will be in Africa. “This position was reached after very careful consideration of information gathered from extensive investigations at both candidate sites,” Professor John Womersley, Chair of the SKA Board of Directors, said in a statement. Individual antennas will now therefore be located in spots as diverse as Ghana and New Zealand. Both nations profess to be chuffed, even though they’ve only won part of the prize. South African newswire news24.com reports South African Science and Technology Minister Naledi Pandor as saying "We accept the compromise in the interest of science and as acknowledgement of the sterling work done by our scientists and the excellent SKA project team." South African President Jacob Zuma said, in a statement, “We are especially proud of winning this bid particularly on Africa Day. Africa is indeed rising. South Africa is confident that the country will deliver on the expectations of the continent and world."